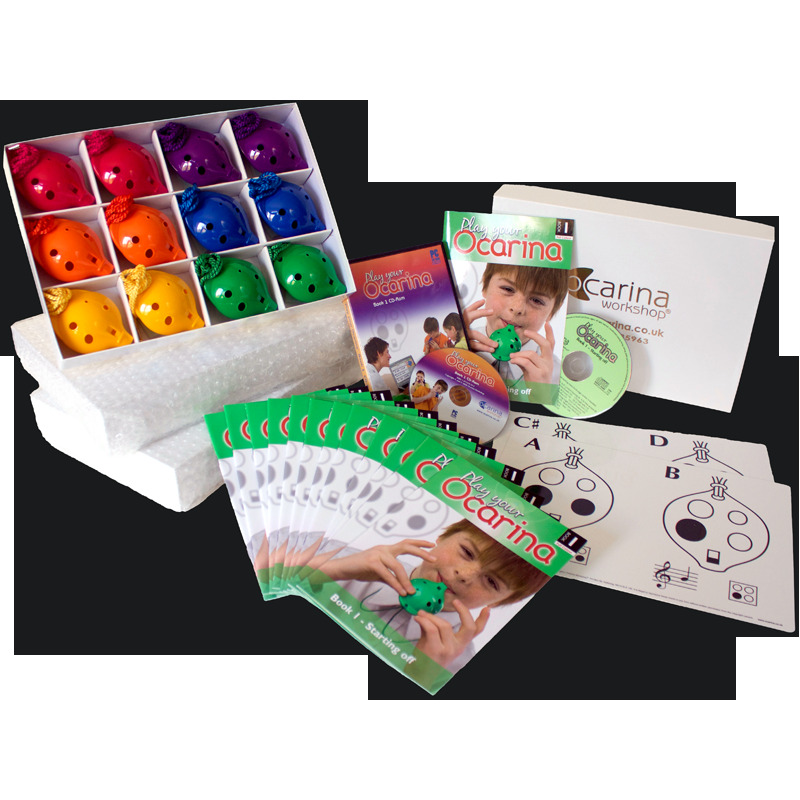 Book 1 Whole Class Pack is all you need to equip 36 players each with an Oc (4-hole or 6-hole, you choose) and a Book 1 'Starting Off' all neatly supplied in three classroom storage boxes. 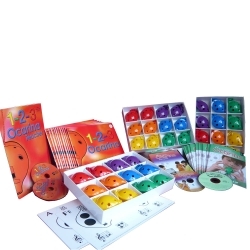 As well as that, we'll include some free resources for the Teacher – the CD-Rom software with all 22 tunes to project and play along with the backings, Flashcards for first lessons, and an extra tutor book with audio CD. 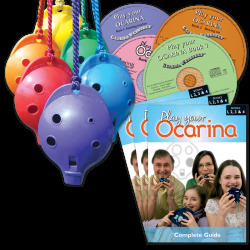 The 6-hole Oc is identical in size and pitch to the 4-hole Ocarina – it just has two added thumb-holes which give four accurately-tuned extra notes. 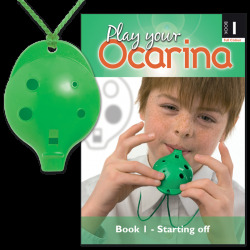 For all of the tunes in Play your Ocarina Book 1 'Starting off', keep the thumb-holes closed and play as if you have a 4-hole Oc. 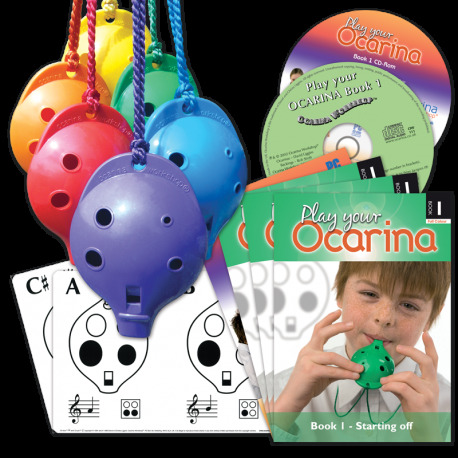 Watch as listen as your children play their ocarinas from the music books, and be amazed! 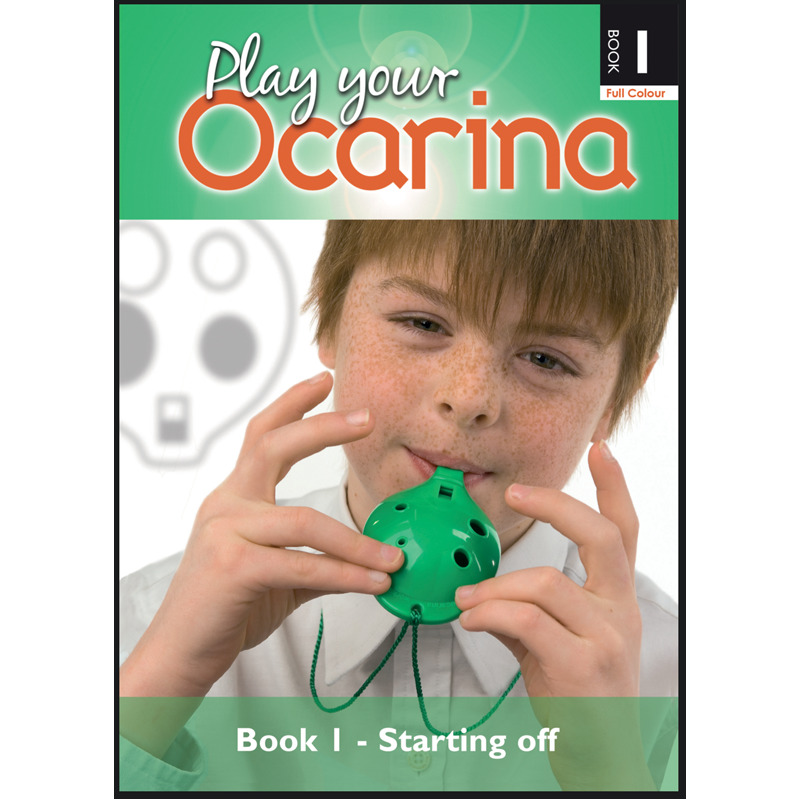 Play Your Ocarina – Book 1 has well-known tunes to start simply, progress steadily and perform competently. 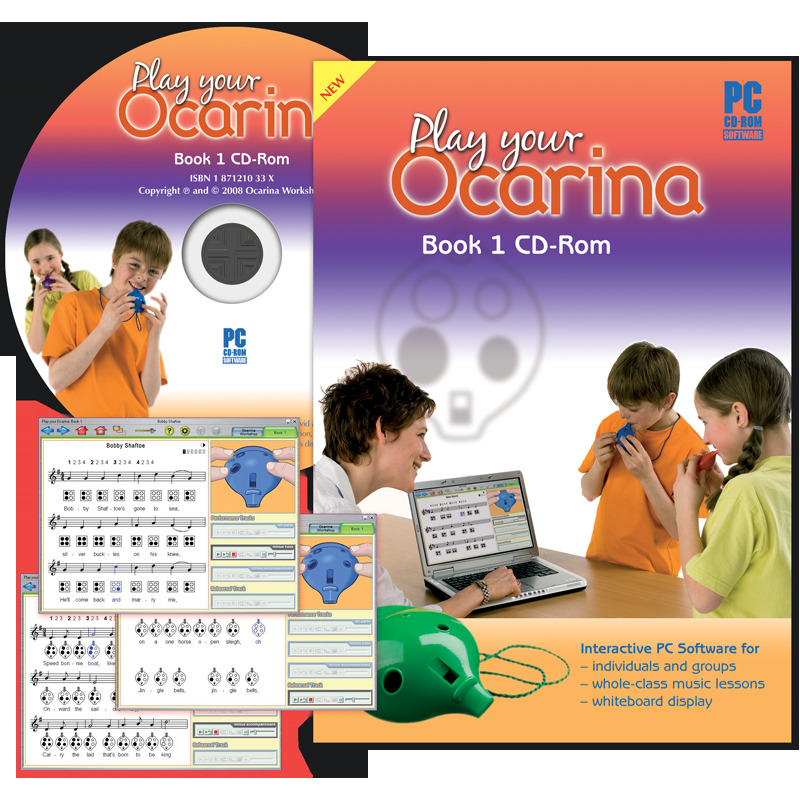 Order 4-hole Ocarinas and get a FREE Book 1 CD Edition, Ocarina Flashcards and the highly acclaimed Play your Ocarina Book 1 CD-Rom interactive software for installation on one PC. 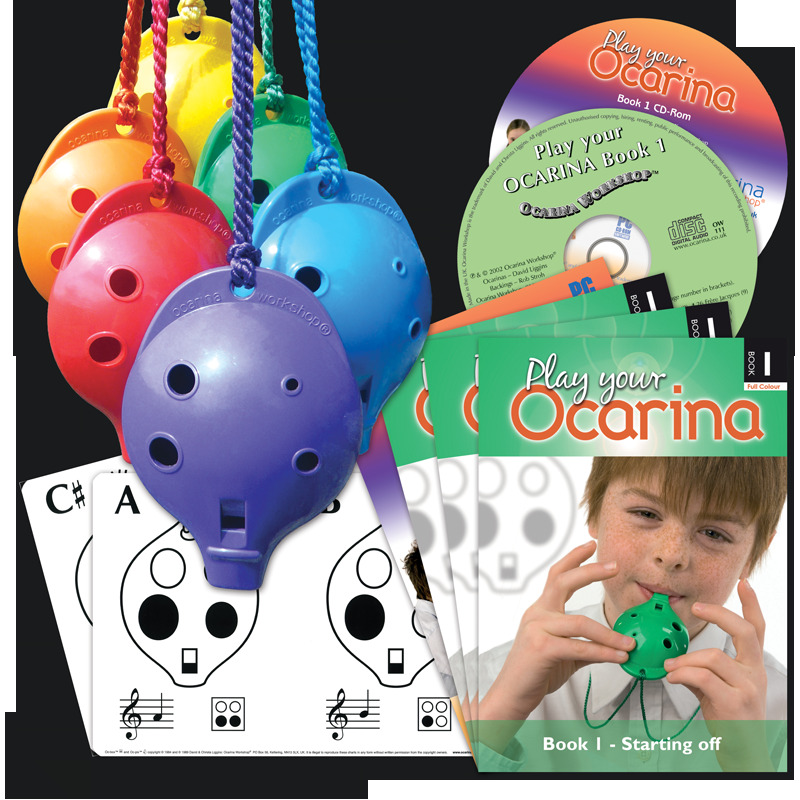 Order 6-hole Ocarinas and get a FREE Book 1 CD Edition and Ocarina Flashcards. 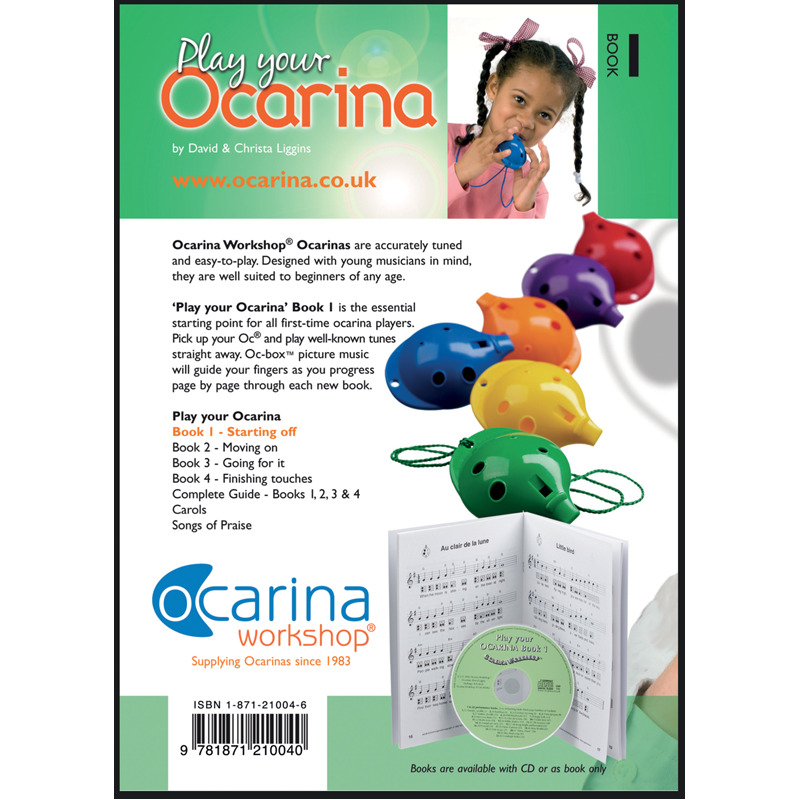 36 x 4-hole Oc® made in the UK for Ocarina Workshop from impact-resistant plastic. Six each of Red, Orange, Yellow, Green, Blue and Purple. 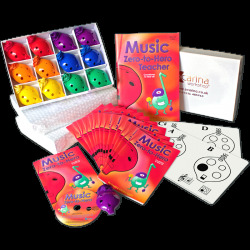 Each book has 32 pages / 22 tunes with musical stave, ocarina finger-charts, guitar chords and words to songs. 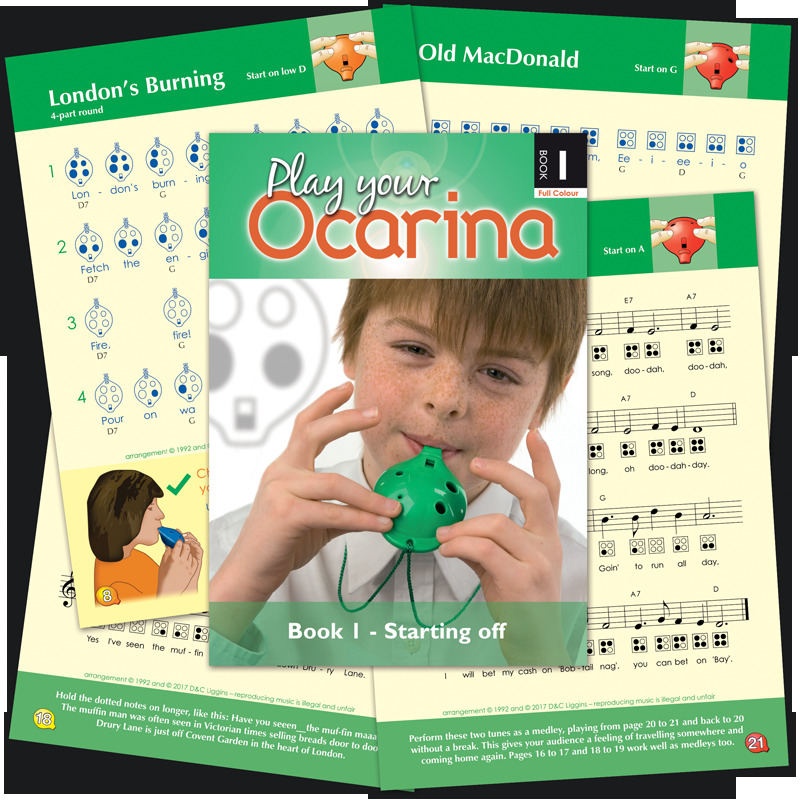 FREE Play your Ocarina Book 1 CD Edition with all 22 tunes for you to listen to and play along with the ocarinas and backings. All 22 tunes are then repeated with the backings only. 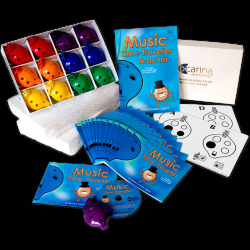 These excellent recordings ensure the musical beginner progresses well. 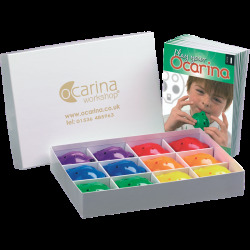 FREE Ocarina Flashcard Set made in the UK for Ocarina Workshop from high-quality PVC. 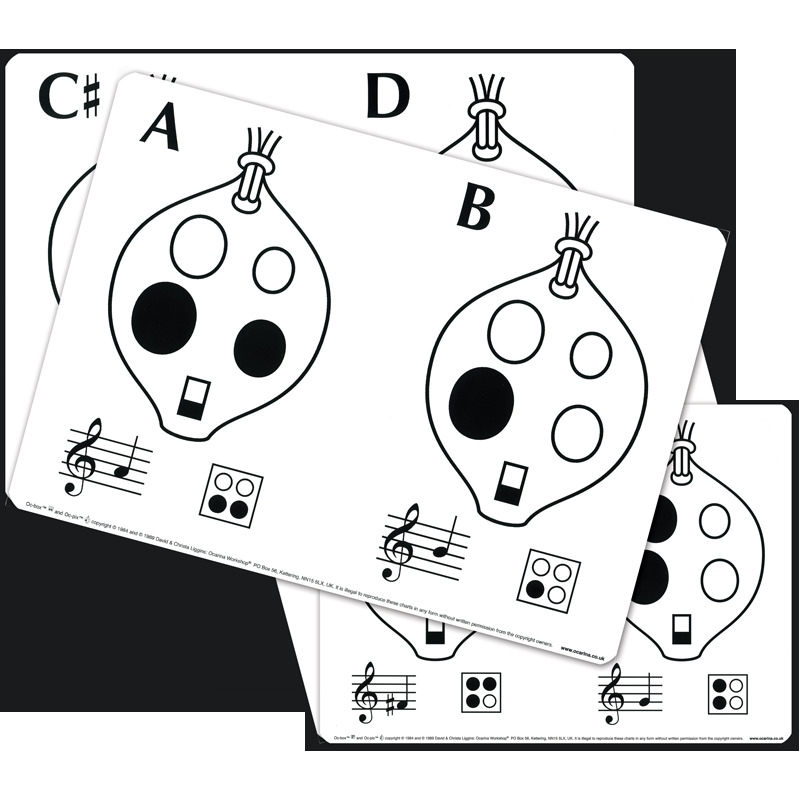 These A4 flashcards show the main ocarina notes for class use. Supplied with Teaching Notes. 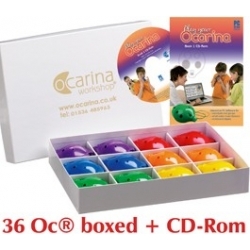 FREE (with 4-hole option only) Ocarina-Teaching CD-Rom Software PC Software disk, one installation per pack purchased. 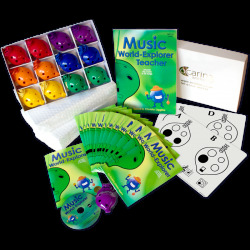 Teachers' Guide 'How to use your CD-Rom', ISBN 1 87 1210 33 0 – 16-page colour book with ocarina-teaching tips and materials included. 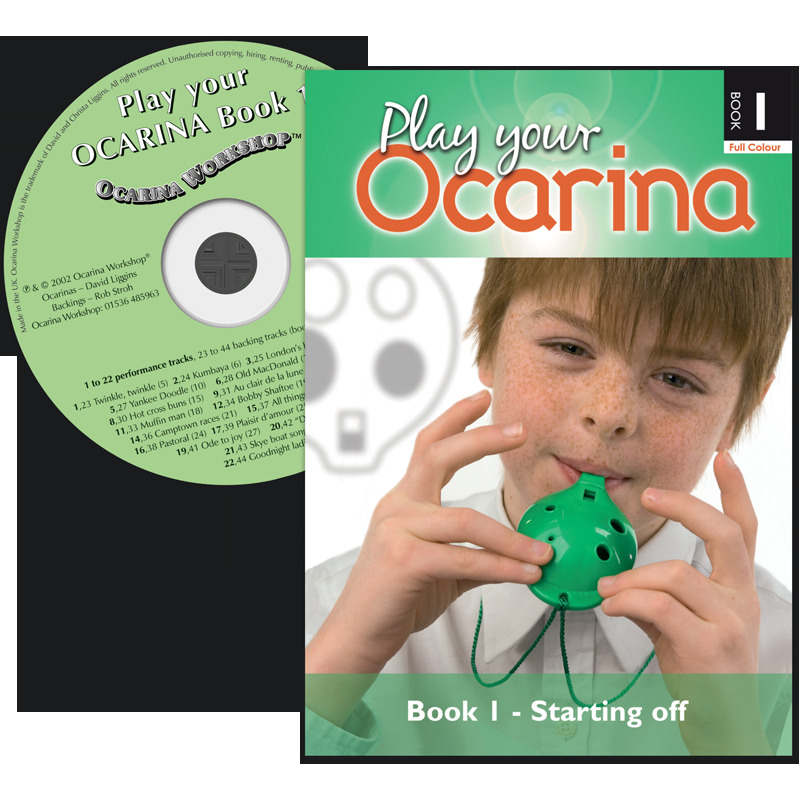 Technical specifications for 'Play Your Ocarina' Book 1 CD-Rom: IBM compatible PC 233 MHz or faster; 16-bit colour monitor, supporting 800 x 600 screen resolution; Windows 98 / ME / 2000 / XP / Vista / Windows 7 and higher; 8 x CD-ROM Drive; 350 MB of Hard Drive space; 128 MB RAM; 16 bit Sound Blaster compatible sound card.